It is tradition in Japan to enjoy soba noodles on New Years Eve because it is believed they bring good fortune. Their long and thin length is synonymous with a long and healthy life. Also since the noodles easily break when eaten, it symbolizes letting go of hardship from the year before. So basically make this recipe and you will flourish in 2018. I’ve been seeking out and enjoying soba noodle soups at Japanese restaurants for the past few weeks as I find nothing more comforting during the winter months. I decided it was about time I made a go-to-soba soup recipe that I could enjoy at home and share with all of you. The broth for this recipe is ridiculously simple. It consists of kombu, dried shiitake mushrooms, tamari, and mirin. It’s a vegetarian version of a dashi broth that uses dried shiitake mushrooms instead of bonito flakes (dried smoked fish). Since you need to soak the kombu for a minimum of 8 hours, I recommend making this broth in advance and freezing. 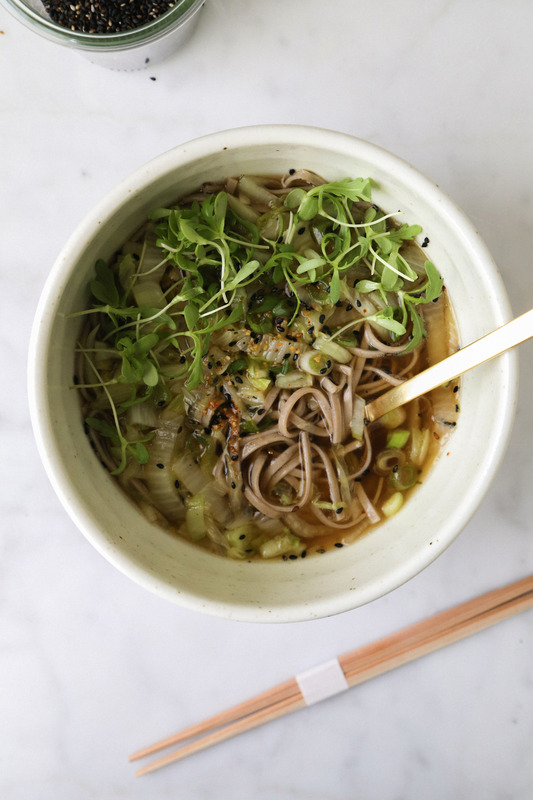 This way, the comforting, nurturing, and tasty hot soba soup only takes 10 minutes to prepare. Dried kombu, a type of kelp, is the heart of this recipe. Kombu is a superfood because it is packed with nutrients and minerals. It also aids in digestion- try adding it to water when cooking beans. Just as important, Kombu lends a delicious umami flavour to recipes. You can find dried kombu at most Asian grocers or even Whole Foods. What is great about this soup is it is highly customizable. Add any of your favourite toppings to this soup. I personally love a nice soft-boiled egg. You can also add chopped spinach leaves to up your greens. Combine the kombu and water in a bowl. Soak kombu for 8 hours or overnight in the fridge. Over medium-high heat bring the water with kombu to a simmer. Remove the kombu right before water comes to a boil. Add the shiitake mushrooms and simmer for 1 minute. Remove saucepan from heat and steep for 5 minutes. Remove the mushrooms (can slice and place into soup). Place the saucepan back on the heat. Add the tamari and mirin and bring to a boil. Strain the broth and set aside. Reheat before serving. In a skillet, heat the oil/butter over medium heat. Add the nappa cabbage and stir fry until softened, about 5 minutes. Remove from heat and drizzle with sesame oil and season with sea salt. Cook the soba according to the package instructions. Drain and then rinse in cold water. Prepare the soup. Place the soba in bowls and cover with hot broth, cabbage, and green onions. Serve immediately! This entry was posted in Soups and tagged buckwheat, comfort food, dashi, holiday, japanese, kombu, new year, noodle soup, Soba, soup, Vegan, Vegetarian, winter. Bookmark the permalink.